Dr. Ernst Krebs observed that during the deadly 1918 Spanish Flu epidemic that the American Indians in the Southwest were recovering from the virus. He published an article titled "An Indian Remedy for Influenza." Here is a copy of the article as it was republished in the Bulletin of the "Nevada State Board of Health" in January of 1920. To purchase a tincture of Lomatium Dissectum, click here. Bulletin of the Nevada State Board of Health, No. 1, Carson City, Nevada, January, 1920. AN INDIAN REMEDY FOR INFLUENZA - ERNST T. KREBS, M.D. In publishing this paper the State Board of Health does not give its endorsement to the remedy until it has had further trial. We merely present the facts as stated by Dr. Krebs, with the idea of giving the matter publicity and encouraging others to give it a trial. During the fall of 1918 when the influenza epidemic visited this section of Nevada, the Washoe Indian used a root in the treatment of their sick which was gathered along the foot-hills of this slope of the Sierra. The plant proved to be a rare species of the parsley family (Leptotaemia dissecta), according to a report from the University of California. The Indians gather this root in the late fall, November being considered the proper month for gathering. 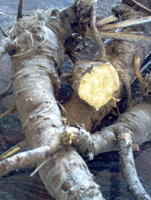 The root is used in the fresh or dry state. It is cut up and a decoction is made by boiling the root in water, skimming off the top and giving large doses of the broth. A pound of root is considered about the proper dose to treat a case of fever for three days, which is the longest time needed to break up a fever due to influenza or a pulmonary disease, although the Washoes used it as a panacea. 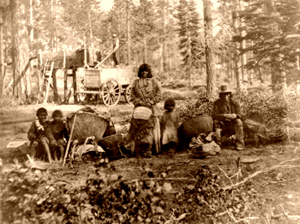 Whether a coincidence or not, there was not a single death in the Washoe tribe from influenza or its complications, although Indians living in other parts of the State where the root did not grow died in numbers. It was such a remarkable coincidence that the root was investigated by a practicing physician who saw apparently hopeless cases recover without any other medication or care of any kind. A preparation was prepared and employed in a great many cases among the whites, from the mildest to the most virulent types of influenza, and it proved, among other things, that it is the nearest approach we have today to a specific in epidemic influenza and the accompanying pneumonia. Where used early it proved itself to be a reliable agent in preventing pulmonary complications. Other physicians were induced to give it a trial, with the same results. It is beyond the experimental stage, as its therapeutic action in this direction is established and beyond any doubt. The cases in which it has been used run into the hundreds. There is probably no therapeutic agent so valuable in the treatment of influenzal pneumonia and, as far as being tried, in ordinary lobar pneumonia if started early. Its action on coughs is more certain than the opiate expectorants and its benefit is lasting. It acts as a powerful tonic to the respiratory mucous membranes. It is a bronchial, intestinal and urinary antiseptic and is excreted by these organs. It seems to stimulate the pneogastries (sic) and causes a slow pulse with increased volume and reduced tension. It is a pronounced diaphoretic and somewhat diuretic, and it is a stimulating and sedative expectorant. In large doses it is a laxative, and in extreme doses emetic. To make a therapeutically active preparation, the proper variety of the root must be selected in the late fall and properly cured out of the sun. Its active principles must be extracted with as little as possible of the objectionable constituents. The active principles of the root are decidedly complex. It contains a glucoside (as its solutions precipitate copper from Fehling?s solution). It contains one or more alkaloids and an acid analogous to benzoic acid, one or more volatile and fixed oils, a resin and a gum. It can be seen from this that it resembles a balsam from the fact that it contains an oleogumresin and an acid besides alkaloids and glucosides. One can at once appreciate the fact that a reliable pharmaceutical preparation representing the action of the root is not readily made. The volatile oil, which is one of the principal therapeutic agents, is lost in making a decoction. This particular variety of Leptotaemia is not as common as believed as some, and it is this particular variety that has medicinal or therapeutic virtues. It grows in dry sandy soil, as a rule, under or between tall sagebrush or greasewood. The plant grows from two to four feet high and has a blossom similar to wild parsnip and leaves like a carrot. It is a perennial, and the older roots frequently weigh from two to six pounds. It sprouts early in April, blooms in May, seeds in June, and withers in July. A number of trials in transplanting the root have been made, but none were successful. Leptotaemia dissecta is destined to become one of the most useful if not the most important addition to our vegetable materia medica. Other Medical Studies and Articles about Lomatium In this article for clarity I will use the name "Lomatium" when referring to the plant whose botanical names are Leptotaenia Dissecta, Leptotaenia Multifida, and Lomatium Dissectum. In 1948, a collaboration between the "Department of Pediatrics at the Western Reserve University School of Medicine" and the "Babies and Children's Division of the University Hospitals" of Cleveland, Ohio produced a paper titled "Antibiotic Agents Separated from the Root of Lace-Leaved Leptotaenia." "...The first colorless oil ... to inhibit completely Staphylococcus aureus and Escherichia coli... after five minutes' contact with or without shaking. No evidence of growth in cultures was observed in cultures removed after one hours' contact." The paper contains a chart listing the effectiveness of Lomatium against 41 strains and species of bacteria and 21 strains and species of mold and fungi. It was determined to have inhibited?in varying degree?the growth of all microorganisms tested. In 1949, a collaboration between the "Departments of Bacteriology and Chemistry" at the University of Utah and the "Latter-Day Saints Hospital" in Salt Lake City, Utah produced a paper "Antibiotic Studies on an Extract from Leptotaenia Multifeda." 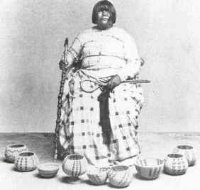 It documented that Lomatium was used by the Gosiute Indians in Utah and that they applied it to open wounds, cuts, or bruises where the skin was broken. As in the 1948 study by the Department of Pediatrics in Ohio listed above, this paper lists the methods of extraction of Lomatium and its effectiveness against specific organisms and bacteria. Quotes from the paper state that "Penicillin G and the Lomatium extract ... were roughly comparable in antibacterial activity...". In 1951 a student in Microbiology at the University of Southern California submitted a thesis entitled "Studies of the Antibacterial and Antifungal Properties in Vitro of Oil Isolated from Leptotaenia Dissecta" The conclusions of this thesis agree with the previous studies that Lomatium as an alternative to standard antibiotics was effective against specific organisms and bacteria. In 1952, the Department of Bacteriology at the University of Utah performed experiments in the "Studies on an Antibiotic Extract of Leptotaenia Multifeda." This study tested Lomatium on mice that had been intentionally infected with bacteria and viruses. The effectiveness of Lomatium as compared to tests conducted using penicillin was determined. It was summarized that "the extract of the roots of Lomatium exhibits relatively high activity against a wide variety of? bacteria." In 1957, the U.S. Department of Agriculture published a revision of the 1941 study "Medicinal Uses of Plants by Indian Tribes of Nevada". This revision listed the changes in the scientific names of medicinal plants used by the Indians and included a table of "Results of Use." This edition of the study is on file with the Smithsonian Institution.